A Hazleton woman was killed in a collision in Buchanan County Monday night. The Iowa State Patrol says an SUV was heading east on 140th Street when it collided with a semi heading north of Mason Avenue. Both vehicles collided in the intersection and came to rest in the ditch. 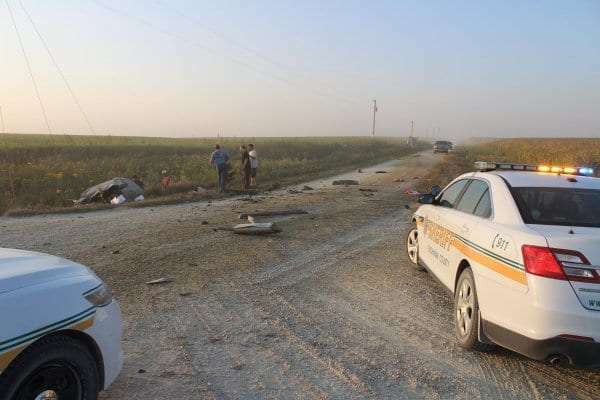 The Buchanan County Sheriff’s Office says SUV driver, 47-year old Tamara Miller-Fuller, was not wearing a seatbelt and was ejected from her vehicle. She was transported by ambulance to Mercy Hospital in Oelwein with life-threatening injuries and died a short time later. The Sheriff’s Office says driver of the semi, 52-year old Perry Klosterman of Strawberry Point, sustained minor injuries in the crash and did not require medical attention. The Buchanan County Sheriff’s Office was assisted at the scene by the Iowa State Patrol, Hazleton Fire Department, Stanley Fire Department and Oelwein Mercy Ambulance Service.